Fionnuala Quinn and I are putting the final touches on the advocates guide that we will be printing soon. As we noted earlier, FABB received a grant from the Alliance for Biking & Walking to produce a Guide for Reviewing Public Road Design and Bicycling Accommodations for Virginia Bicycling Advocates. We (mostly Fionnuala) have spent the past year meeting with state and local transportation staff and bicycle advocates, researching bicycle facility design issues, and writing the guide. We've just edited the latest version that is nearly ready for publication. We hope to receive the updated version tomorrow and will take one last look at it before sending it off to the printers. The layout looks great. We think it will be a useful publication. More later. Bicyclists will take over the Reston Town Center on Sunday for the Reston Grand Prix Bicycle Races. The main streets in the Reston Town Center will be closed for most of the day. The racing starts at 7:45 a.m. with the Cat 5 men's race and ends with the Cat 1/2/3 men's race at 2:45 p.m., including three women's races in between. Bikes for the World will be collecting bikes throughout the day. The course is a 1.25 km loop through Reston with 8 turns. Bike to Work Day this year in the Metro DC area was the biggest ever, with over 9,000 people participating. There were three new pit stops in Fairfax County. The weather was beautiful. John Brunow of bikes@vienna has been providing bicycle parking at two Vienna elementary schools, Cunningham Park and Wolftrap. The racks, which are event racks that we've used for bike valet parking in the past, are getting a lot of use as you can see from the photo. 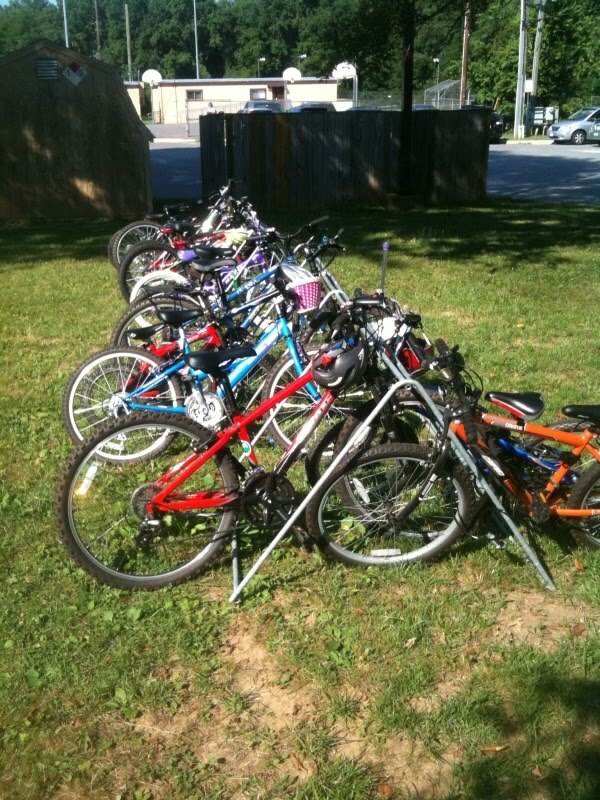 Many schools have no bike parking. At others kids are not even allowed to bike. It's great to see that this experiment in placing racks at these schools seems to have worked well. Let's hope it's incentive for the schools to do more to encourage kids to walk and bike to school. Back in November of last year members of the Fairfax County School Board and Board of Supervisors had a joint meeting to discuss in part the need to get more kids walking and biking to school. During that meeting Dean Tistadt, Chief of Facilities & Transportation Services for Fairfax schools said that if a school needs a rack he would provide one instantly. Maybe it's time to take him up on his offer. Thanks to John for providing the racks not only here but at the Vienna Farmers Market, located next to the W&OD Trail, each Saturday. It does make a difference. Transformed Tysons Corner still years away in Fairfax is the title of an article in today's Washington Post. As we reported earlier, the Board of Supervisors approved the Tysons plan at their Tuesday meeting. To our knowledge, this is the first time that bicycle parking guidelines are included in the county's comprehensive plan. There are also plans for an extensive network of bike lanes throughout Tysons and the Post published the conceptual bicycle plan map on the right. This map is a placeholder. It was developed by county staff and FABB. As stated in the plan, "A bicycle master plan study has been initiated for the greater Tysons area. Once completed, bicycle routes in, around, and through the urban center will be refined and Map 8 will be updated." That process is scheduled to begin around the first of July. The plan will extend to a 3 mile radius around Tysons which includes planning bicycle access to Tysons, Pimmit Hills area, Vienna, and other surrounding areas. Several public meetings are planned to provide area cyclists the opportunity to weigh in on proposed bike routes and other bicycle facilities needed in Tysons in the future. This is a huge win for Fairfax cyclists. Thanks to FABB members and all the cyclists who attended the many public meetings to speak out for the need for Tysons to become a bicycle-friendly place. We hope you continue to be involved as the Tysons bicycle plan process gets underway. Welcome to our newest Revolutionary! 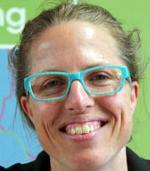 Revolution Cycles is thrilled to welcome Angela Koch (pronounced Cook!) to the team as the new Events and Advocacy Coordinator . After spending over ten years in Portland, Angela is excited to be back on the East Coast and to share her bicycle advocacy knowledge with the Revolution Cycles organization and the DC Metro area. In her most recent position as the Operations Director for the Bicycle Transportation Alliance, Angela advanced cycling causes through the support of legislation and education, and we are very fortunate to have her as a member of our team planning events and working to improve the cycling experience in our communities. Be sure to participate in Revolution Cycles events and meet Angela in person! Welcome Angela. We look forward to meeting you in the near future. Many people spoke out in support of the Tysons plan at the Board of Supervisors public hearing tonight. Many of those people noted that Tysons must become a walkable, bikable community to succeed. Transforming Tysons into a bike-friendly place was one of the first goals of FABB (as is evidenced by the number of FABB blog posts about Tysons). We think the proposed plan will go a long way toward achieving that goal. One major problem continues to be that Routes 7 & 123 are still too wide and lack bicycle facilities. If they are not fixed when Metro arrives, it is hard to envision Tysons being bike- and ped-friendly. Instead of fixing them later, now is the time to get their design right. Planning Commissioner Walter Alcorn and other members of the Tysons Corner Committee are to be commended for working with the community and listening to our concerns about the shortcomings of the initial plan and addressing many of those concerns. It's still not a perfect plan but it is a major step in making Tysons a more sustainable, liveable place. See our earlier post about bicycle provisions in the plan. Creating 10 new miles of bike lanes on Gallows Road, Westmoreland Street, Lawyers Road and other streets. Completing the bicycle and pedestrian bridge on Wolftrap Road near Joyce Kilmer Middle School, providing non-motorized access between Tysons Corner and the town of Vienna. Purchasing 150 new bike racks for locations across the county. 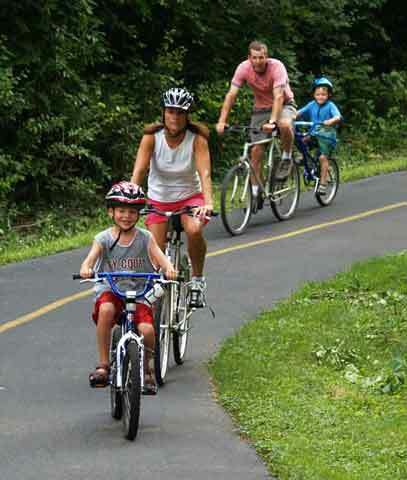 Securing a $104,000 federal grant to create the Sully District Historic Sites Bike Map, a guide to family-friendly bike routes that highlight Civil War and historic sites in western Fairfax County. Winning a Virginia Department of Health grant to buy and give away 200 bike helmets to children. Bike racks on the front of all Fairfax Connector buses. Bike storage lockers at the county's Herndon-Monroe and Reston East park-and-ride lots. Bike map with on- and off-road routes across the county. Congratulations to Charlie for this well-deserved award. A great deal has been accomplished since Charlie became the county's first bike coordinator in 2006. While the county has a long way to go before becoming truly bike-friendly and many FABB goals are yet to be achieved, we've made great progress and Charlie and the bike program deserve to be recognized for their hard work. 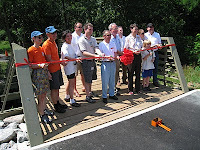 FABB attended the ribbon-cutting ceremony for the new Wolftrap bridge connection near Kilmer Middle School. This is a great connection and an example of cooperation between the Park Authority, which owns the land, and the Dept. of Transportation, that had the idea for the bridge and provided funding. Supervisor Smyth was a strong supporter and help secure funding through the 2007 transportation bond referendum. Five of us rode from Vienna to the ceremony. Along the way we stopped to take a picture of Jenifer Madden, Hunter Mill District Transportation Advisory Committee representative, in front of the bike rack that her family donated to the school at Our Lady of Good Counsel. Many cyclists take an informal detour through the church parking lot on the weekends. After the ceremony we rode back along Gallows Rd to the new bike lanes that start at the W&OD Trail. There is funding for bike lanes from just north of Dunn Loring Metro station into Tysons. Thanks to Fairfax County DOT and Park Authority for making this connection. Kirk Holley of the Park Authority noted the importance of the connection and that they were anxious to help make similar connections throughout the county. The plan to remake Tysons into a walkable, bikable, mixed use community is nearing the final stage. On Tuesday, June 22 the Board of Supervisors will hold the final public hearing on the Tysons plan. The plan approved by the Planning Commission includes many provisions for bicyclists; bike lanes on many of the major roads, bike parking requirements, planned connections to surrounding neighborhoods. See our previous post on the Planning Commission hearing. A major shortcoming of the plan is the lack of any bicycle facilities on Routes 7 and 123. These streets pass through the heart of the future Tysons, where the four Metro stations will be located along with most new commercial, retail, and residential development. Cyclists will be able to reach these roads but not travel along them. The public hearing is scheduled to begin at 4:30pm. on the 22nd. Cyclists are encouraged to contact their county supervisor to support the bicycle recommendations included in the plan and ask that Routes 7, 123, and International Drive be designed to accommodate bicyclists. Planning for the redevelopment of the Annandale and Bailey's Crossroads business centers (community business centers, CBC) is nearing completion. We just learned that the Fairfax County Planning Commission will hold two public hearings on June 23 to discuss changes to the comprehensive plans for these two areas. The changes include recommended bicycle facilities. The Annandale plan contains general language about the need for better bike facilities, including: "Bicycle lanes should be provided within the Annandale CBC where appropriate." The Bailey's Crossroads plan contains much more detailed recommendations for bicycle facilities, including a map showing planned bike lanes on specific streets. 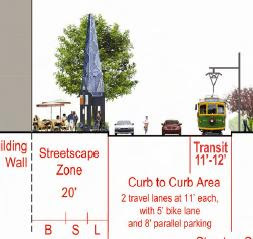 Street cross sections show recommended bike lane widths. However, bike parking guidlines are vague: "In an effort to encourage bicycling in Baileys Crossroads CBC, safe, secure, and convenient bicycle parking should be provided. The number of bicycle parking spaces should be determined based on the planned land uses." If you are familiar with these areas, please take the time to review the proposed plans and see what you think. The Annandale plan needs work. At a minimum we think that the bike routes shown on the county bicycle map should include bicycle facilities, either bike lanes or wide curb lanes. Bicycle parking guidelines for the county, that have been under development for three needs, need to be finalized. Send comments about both plans to Mason District Supervisor Penny Gross and Mason District Planning Commissioner Janet Hall. It would help to attend the public hearing and speak out for better bicycle facilities in these two urban areas. If the county had a comprehensive bicycle plan and bicycle parking guidelines, updating the area plans would be straightforward. As it is, each plan is approached in separately, as resources become available. Fortunately the bicycle planning process has started. Phase I of a countywide plan will begin in Tysons. A contract for the bicycle master plan for Tysons Corner is being negotiated this month, with work expected to begin in July. Arlington County is using infrared sensors to count bicyclists on the Custis Trail. The sensor is located at Lee Hwy/I-66 intersection just outside Rosslyn. It's the start of the long downhill section heading into Rosslyn that is a combination of wide sidewalks and asphalt trail. There were 40,000 bicycle trips on this section of the trail in May. According to CommuterPageBlog, "The counter is located here and has the ability to distinguish between pedestrians and bicyclists by means of infrared and in-ground technology. Furthermore, this 24/7 counter can track the time of day trips are made and breaks the final report down into 15 minute increments. Arlington County's Bicycle and Pedestrian Planner, David Patton, manages the counters and provides us with monthly numbers." Bike to Work Day shows up as a spike in the data with the highest daily total. The four lowest counts coincide with cold and/or wet days. This is excellent data that will be valuable in the future for showing changes in bicycle use. Fairfax should be implementing a similar system. Unfortunately the counts conducted by VDOT the last few years were discontinued due to budget cuts. 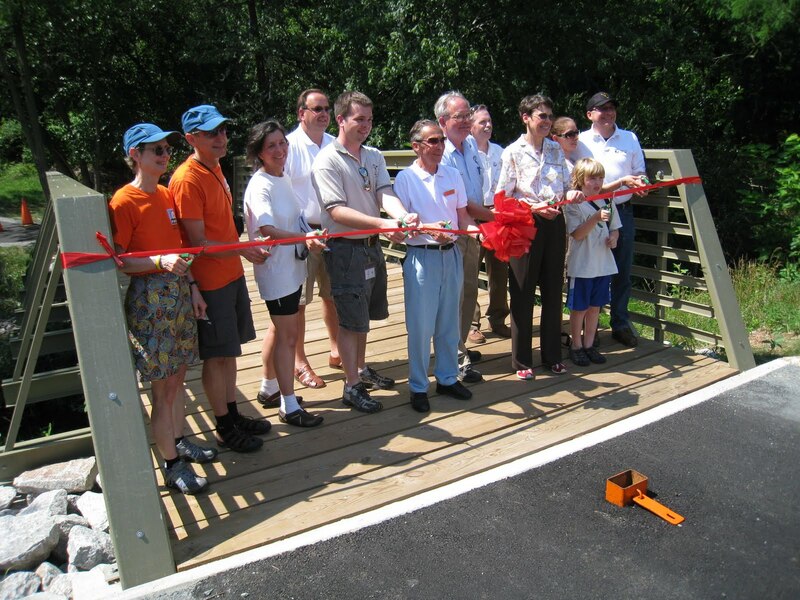 Join FABB for a ride to the recently opened bridge connecting two sections of Wolftrap Rd near Kilmer Middle School. It's a great connection in the Tysons area near Gallow Rd where bike lanes are planned in the near future. The ride will leave from Vienna Town Green leaving at 2:15 pm, tomorrow, Saturday. The ride is about 2.5 miles and the ceremony is planned for 3:00. An option return ride would follow Gallows Rd to the new bike lanes that start at the W&OD Trailand lead to the Dunn Loring metro station. Here's the proposed route. We'll be waiting at the Vienna Town Green, dressed in our orange FABB t-shirt. Hope to see you at 2:15 tomorrow. The National Bicycling and Walking Study: 15-Year Status Report, published by the Pedestrian and Bicycle Information Center, is an update of the 1999 and 2004 reports: "...the 15-year update measures the progress made toward the original goals of lowering the number of fatalities while increasing the percentage of trips made by bicycling and walking." "The number of reported walking trips has more than doubled since the first survey, from 18 billion in 1990 to 42.5 billion in 2009. Bicycling trips saw a similar increase, from 1.7 billion to 4 billion reported trips during the same time period." The report includes information on national trends in funding, mode share, and safety. It also summarizes current programs that promote biking and walking such as the Nonmotorized Transportation Pilot Program, Safe Routes to School, and Livability initiatives. While it's way past time to embrace a clean energy future, the disaster in the Gulf of Mexico should have all of us questioning our use of fossil fuels. As cyclists we have made a choice to reduce that dependency by using bikes for many of our trips. That clean energy source, human power, is available now. For decades, we have known the days of cheap and easily accessible oil were numbered. For decades, we’ve talked and talked about the need to end America’s century-long addiction to fossil fuels. And for decades, we have failed to act with the sense of urgency that this challenge requires. Time and again, the path forward has been blocked—not only by oil industry lobbyists, but also by a lack of political courage and candor. Each of us has a part to play in a new future that will benefit all of us. As we recover from this recession, the transition to clean energy has the potential to grow our economy and create millions of jobs—but only if we accelerate that transition. Only if we seize the moment. And only if we rally together and act as one nation—workers and entrepreneurs; scientists and citizens; the public and private sectors. When I was a candidate for this office, I laid out a set of principles that would move our country towards energy independence. Last year, the House of Representatives acted on these principles by passing a strong and comprehensive energy and climate bill—a bill that finally makes clean energy the profitable kind of energy for America’s businesses. Now, there are costs associated with this transition. And there are some who believe that we can’t afford those costs right now. I say we can’t afford not to change how we produce and use energy—because the long-term costs to our economy, our national security, and our environment are far greater. 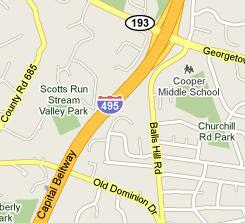 We'll be meeting tomorrow, Wed. June 16 at Patrick Henry Library in Vienna, a block from the W&OD Trail. We'll be starting at 8pm, later than usual. Charlie Strunk the county bike coordinator will give us an update on county activities, we'll discuss several recent events including the Celebrate Fairfax bike valet parking, City of Fairfax bike rodeo, development of a bike route from Vienna Metro to GMU, and updates from the Vienna and Herndon bicycle advisory committees. We'll also have a Tysons update, including info about the upcoming Coalition for Smarter Growth walking tour of Tysons on Saturday, where we'll be discussing bicycle assess, and the June 22 Board of Supervisors' public hearing on the Tysons plan. 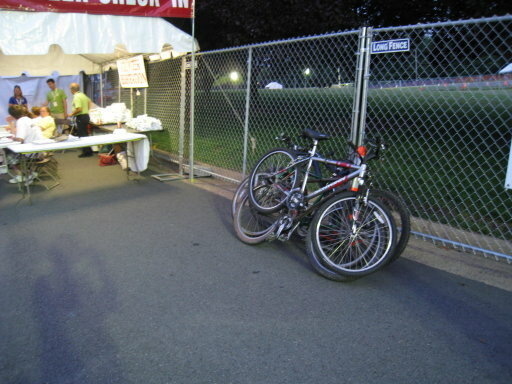 As we've mentioned, FABB will provide free bike valet parking at Celebrate Fairfax! on Sunday. If you bike there today (Saturday) you're on your own. To check out what bike parking options there are on the site when there's no bike valet provided we rode to the event last evening. The road in front of the government center is blocked so we rode up to the person directing traffic and asked where the bike parking was located. He looked puzzled and asked a nearby policeman who said there's no bike parking and that we could probably lock up our bikes against the fence. We could ask at the next gate if we liked. We rode to the next gate and asked there. Same response. One person said we could probably lock up our bikes in front of the government center where there are two large grill racks. Small problem, bikes aren't allowed in that area. There's a sign (above) that greets cyclists as they approach the entrance to the fair on the government center grounds that pretty clearly states that bikes aren't welcome. The pile of bikes parked in the photo on the left were locked next to the entrance and shows what happens when you have only one cable lock and no bike valet parking. There are bike racks located at the two county buildings across Government Center Parkway. Let's hope next year Celebrate Fairfax! sends a more welcome message to bicyclists. They are doing so this year with Ride to the Fair Day on Sunday, but there needs to be better bike parking during the entire event. Many people live in this area and should have the option of biking to the fair. We'll be there tomorrow and hope lots of cyclists show up on bikes, showing that there is a need for good bike parking. There are a number of routes to the Government Center as indicated on the Fairfax County Bike Map. See the Government Center area map for details. Update: Thanks to the FABB volunteers who helped out on Sunday for the bike valet service. 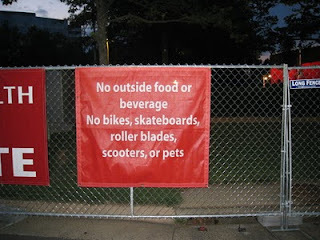 Unfortunately there were very few people who rode to the fair. One problem is that few people think of using bicycles for transportation in this area. Even though experienced cyclists have no problem riding here, there are no dedicated on-road bike facilities and the trails are unmarked and not well maintained. Until Fairfax makes a commitment to developing a better bicycle infrastructure, only the most dedicated cyclists will use bikes for transportation. Valet parking at Celebrate Fairfax! Sunday, June 13 is Bike to the Fair Day. For the first time, FABB will provide FREE bike valet parking when you visit Celebrate Fairfax! on Sunday. Volunteer attendants will be there from 10:30am to 7:30pm to keep an eye on your bike until you return. If you'd like to help, volunteers are still needed for the 3:00-5:00 pm and 5:00-7:30 pm time slots. Volunteers receive a ticket for entry to the event so why not bike to the fair, check out the exhibits and music acts on three stages, and help with the valet parking. Or just bike to the fair. At the HOT lanes meeting last night several cyclists spoke in support of including bike facilities on the Old Dominion and Georgetown Pike bridges across the Beltway as part of the extension of the HOT lanes project. The bridges will be rebuilt if the extension is approved. The cyclists may not support the HOT lanes extension, but if the project goes forward, this is the only chance for the next 50-60 years for including bike facilities on those bridges. 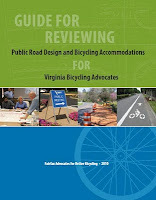 It's consistent with the VDOT Policy for Integrating Bicycle and Pedestrian Accommodations, with the new FHWA Policy Statement on Bicycle and Pedestrian Accommodations, and it's the right thing to do. It was important to show your support. Others in attendance belittled the idea of people actually wanting to bike in that area. Thanks to everyone who came to the meeting. As we mentioned earlier, cyclists are encouraged to attend a meeting on the proposal to extend the Beltway HOT lanes north toward the American Legion bridge. The bridges at Old Dominion Dr and Georgetown Pike bridges will be rebuilt and if bicycle facilities are not included now, there will not be another opportunity in our lifetime. The meeting is Wednesday, June 9 at 7:30 pm at the McLean Community Center, 1234 Ingleside Avenue, McLean. That's the name of a safety campaign to be conducted by the Reston police during June 12-25. In an effort to raise awareness of the rules and regulations governing trail use, Reston officers will work to educate bicyclists, pedestrians and motorists both on and near the trail. Target areas for the campaign include the Sunset Hills Road and Wiehle Avenue where the W&OD trail crosses Wiehle Ave. The other location will be pedestrian crossing spots in and around the Reston Town Center, especially the Bluemont Way crosswalk. The campaign involves officers traveling on bicycles, cars, motorcycles as well as a marked all terrain vehicle to traverse the W&OD trail. Officers will be closely monitoring the trail and nearby crosswalks and will distribute safety literature to all those that pass by. From the last sentence, it appears the safety campaign is targeting trail users; I doubt officers will be distributing the safety literature to all motorists who pass by. While we welcome any attempts to make conditions safer for bicyclists and pedestrians, and Reston police have gotten better about ticketing motorists, all too often these campaigns have targeted cyclists running stop signs or pedestrians crossing outside of crosswalks. At the Wiehle Ave/Sunset Hills/W&OD Trail intersection, nearby motorists who regularly run the red lights at Wiehle Ave and Sunset Hills Rd when turning right on red are ignored. Many cyclists have been hit by motorists turning right on red there ("right hook"), and yet the problem continues unabated. We all need to obey traffic signals, so be on the lookout for police issuing tickets along the W&OD Trail in Reston. The photo above is accompanies the police news release on the safety campaign. Note the father riding without a helmet, and the mother and son who appear to be riding on the wrong side of a two-way bike trail. Supervisor Foust and Delegate Comstock are hosting a HOT lanes meeting on Wednesday, June 9 at 7:30 pm at the McLean Community Center, 1234 Ingleside Avenue, McLean to discuss extending the HOT lanes north toward the American Legion bridge. As part of the project, both the Old Dominion and Georgetown Pike Bridges would be replaced. Bike facilities are included in the early plans for these bridges. 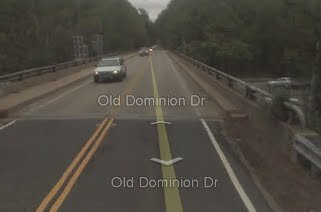 According to the Trails Plan, the Old Dominion bridge should have bike lanes and a major paved trail on the N side. On the Georgetown Pike bridge, a minor paved trail is indicated on the south side and either a major paved or stonedust trail on the north. There is some local opposition to the bike facilities. While Supervisor Foust supports these facilities, cyclists need to attend the meeting to speak out in support as well. For more information please contact: Cheryl Patten in the Dranesville District office at (703) 256-0551, or Elise Marsh in Delegate Comstock's office at (703) 209-3787. Bike group's chief seeks roadway camaraderie is the title of a Post article on Shane Farthing, the new WABA Executive Director. What are your goals and priorities in taking over the regional organization? Obviously, I think that safety is of paramount importance to cyclists. So WABA will continue, and hopefully expand, its work to ensure bicycle-friendly infrastructure that allows motorists, cyclists and pedestrians to share the public right-of-way with minimal conflict. And WABA will also work to ensure that laws are properly applied to cyclists. In some cases, that may mean tweaking laws that may have been written from a car-centric viewpoint so that they can be safely and sensibly applied to bicycles. And in all cases, it means proper and fair enforcement of those laws for all parties sharing the public right-of-way. But in addition to the overarching goal of safety, my primary organizational goal is to expand WABA's outreach and influence -- both geographically and demographically—to ensure that the organization truly represents the needs of the region's larger cycling community, from occasional recreational riders, to daily commuters, to weekend racers. The cycling community is a diverse one, and I want to ensure that WABA's membership and advocacy reflect that diversity. We look forward to working with Shane to ensure WABA represents the needs of Fairfax cyclists. Saturday, June 5, Meet the Met—Celebrate National Trails Day and the opening of the Metropolitan Branch Trail. Meet the Met is sponsored by Rails to Trails Conservancy, Kaiser Permanente, WABA and others. Bruce Wright of FABB will lead a ride to the ribbon-cutting ceremony staring in Reston at 8:45 a.m. Meet at Sunrise Valley Elementary School and be ready to leave at 8:45 sharp. We'll pick up riders in Vienna at 9:15, East Falls Church at 9:45, etc. See the map and schedule and register. 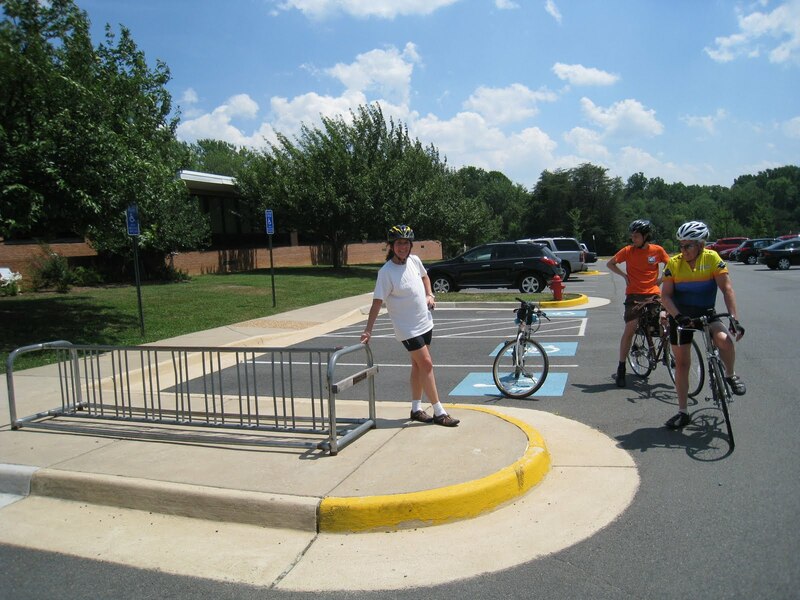 Saturday, June 5, Fairfax City Bike Rodeo—On Saturday June 5 from 10 a.m. to 1 p.m., the City of Fairfax is holding a bike rodeo for children ages 6-10 at Daniels Run Elementary School located at 3705 Old Lee Highway. The rodeo is one of many events being offered as part of Trails Day. Volunteers are needed to help at the registration table, provide a quick bike safety talk and fit kids' helmets. If you are interested in volunteering, or in more information about the event, contact douglas_stewart [at] verizon.net of FABB. Saturday, June 5, National Trails Day Celebration at Lake Fairfax—The Fairfax County Park Authority, members of MORE, the Mid-Atlantic Off Road Enthusiasts, local officials and scores of volunteers will gather at Lake Fairfax Park to mark the 18th annual National Trails Day. Volunteers can join in the trail construction efforts at 9 a.m. at the park. The public is invited to the Park's amphitheatre for groundbreaking ceremonies at 11 a.m. Join local officials and trail enthusiasts as we mark the beginning of Phase 1 development of the Lake Fairfax Sustainable Natural Surface Trail System. This project will eventually add two miles of sustainable natural trail, two bridges and includes the reclamation of 1,200 linear feet of non-sustainable trail in Lake Fairfax Park. A cookout for volunteer workers will be held at 3 p.m. at Picnic Area C. If you’d like to participate, please RSVP by email to ColtsNeck@more-mtb.org. Bring something to share and The Bike Lane will provide the hamburgers and hot dogs. Saturday, June 5, Star-Spangled Banner NHT Bicycle Tour—A two-hour 10-mile bike ride through history. Cross the Woodrow Wilson Bridge and meet costumed interpreters at two historic sites caught up in the Chesapeake Campaign of the War of 1812. Select from one of two start locations: Carlyle House Historic Park, a property of the Northern Virginia Regional Park Authority, or Oxon Hill Park, 6411 Oxon Hill Road, Oxon Hill, Maryland. June 5-6, Free Bike Valet Parking at Herndon Festival—The Herndon Festival will feature a free bike valet service provided by bikes@vienna and the Pedestrian and Bicycle Advisory Committee. Bike racks will be located at the intersection of Elden and Lynn Streets. Relax and enjoy the Festival - knowing your bike is safe with the Bike Valet. Contact FABB member Ian MacDonald, ism [at] iwasdot [dot] com, to volunteer or for more information. Bicycling is a highly efficient mode of transportation, providing a wide range of benefits, including energy conservation, improved air quality, reduction in costs, and improved personal health. To implement the Administration's goal of establishing a clean energy economy, Federal agencies should pursue efforts to establish and support bicycling and other active commuting and travel at Federal facilities. Experience at various levels of Government has shown that appropriate public facilities and programs result in more people bicycling, walking and using other active forms of transportation. Several Federal agencies in the Washington, D.C. area have already taken steps to promote cycling; demonstrating that access for employees and visitors who bicycle can be fully compatible with agency objectives, even those with high security imperatives. This document outlines the necessary steps for cost-effective creation of a bicycle-friendly environment for employees at and visitors to Federal facilities. By taking these steps, agencies can expect increases in active transportation by employees and visitors alike, yielding a multitude of benefits to the Government and the broader community. In August 2009, the Government Accountability Office issued a concurrence decision that Federal agencies could provide the bicycle commuter benefit. Sections include information on Policy, Infrastructure, Encouragement, Education, and Evaluation.